Location: 90 Horsepower Farm Rd. 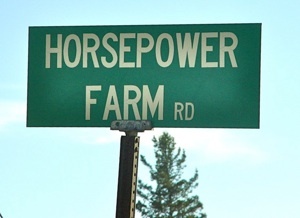 What Makes Horsepower Farm Unique? 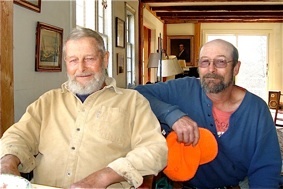 In 1972, Paul and Mollie Birdsall left Connecticut with their two sons, Nathaniel and Andrew, to settle on a 383-acre farm in Penobscot, Maine, that had been owned by the Cunningham and Closson families. The farm was in a state of disrepair. 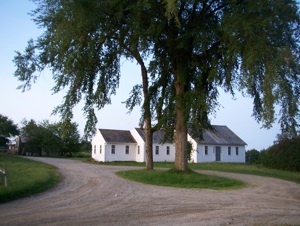 Paul and Mollie rebuilt the 1820‘s farmhouse and were committed to establishing a diversified organic farm. Over forty years have gone by and many changes have taken place. Mollie passed away in 2000, but her spirit lives on through the work and efforts of her family. 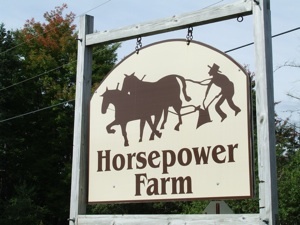 The importance of family is immediately apparent upon visiting Horsepower Farm. Paul Birdsall, now eighty-five years of age, still tends to daily chores, but he has assistance from his son, Andy, and his daughter-in-law, Donna, who have helped to take over the management of the farm. On the day Unique Maine Farms visited their farm, Drew, the grandson of Paul and the son of Andy and Donna, was busy shoeing a draft horse. 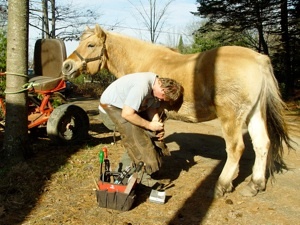 Drew recently graduated from farrier school and his skills are certainly appreciated on a farm where draft horses have always been a focal point of the operation. Lawrence Closson had owned the farm before the Birdsalls purchased it and he always kept a work horse. 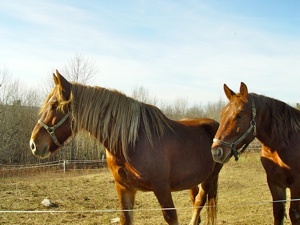 Paul and Mollie began raising Suffolk Punch horses in 1973. They are an English breed of horses that are prized for their stamina, power, longevity, and docility. Paul expressed his appreciation to Billy Tapley over the years for “having a good eye for horses” and helping him out in securing good horses. 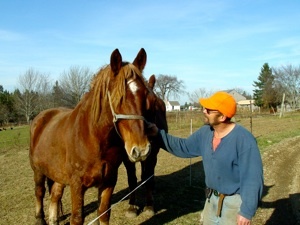 Paul stated that he has enjoyed raising forty or fifty horses since his first horse. With over forty years of experience working with horses, Paul is considered to be an expert for his knowledge of farming with horsepower. Visitors to the Common Ground Fair over the years have enjoyed watching Paul work his teams of horses. The Birdsalls’ horses have been used for plowing, tilling, harrowing, planting, haying, transporting, logging, cultivating, and harvesting. 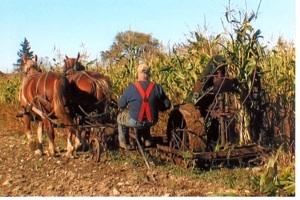 Horsepower has been utilized in preparing the fields for over forty varieties of organic vegetables, fruits, and herbs that are raised by the Birdsalls at their farm. 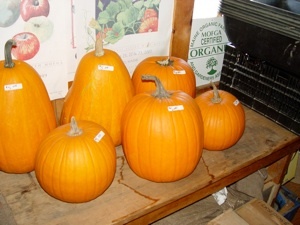 They opened a self-service farm store this past year in which they sell eggs and an assortment of organic vegetables. 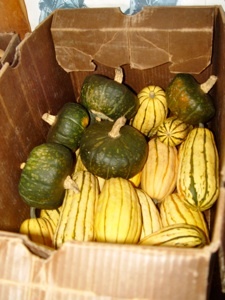 They participate in the Blue Hill, Castine, and Ellsworth Farmers’ Markets and sell their produce to Sedgwick School and the George Steven Academy in Blue Hill and several restaurants and specialty shops. 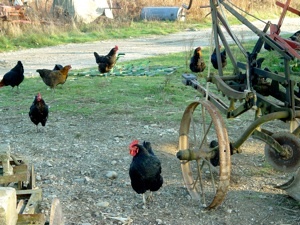 Paul and the Birdsall family have earned a statewide reputation for their work with horses and their long-time commitment and involvement with MOFGA - Maine Organic Farmers and Gardeners Association. They have welcomed over 180 apprentices to their farm since 1975.
chores around 6:30 a.m. He cleans the stalls of the six horses and feeds them. He lets them out around 8:30 a.m. and keeps busy with brushing the horses and working with the harnesses. Of course there are also sheep, chickens, and pigs that need tending. Paul returns to his farmhouse around 1:30 p.m. for his daily lunch of a sardine sandwich! A half-hour nap revitalizes him each afternoon. When he awakens he prepares for the afternoon and evening chores. In the warm weather he enjoys a swim in the farm pond at the foot of the hill on the farm. Because the horses are used for so many different jobs around the farm, the farm schedule each day can turn out to be different. Juggling all the chores and unexpected occurrences can prove challenging. Haying time is intense as the Birdsalls put up several thousand bales of hay for the horses and sheep. Moving some of the heavy implements can also be physically demanding so a tractor is used to help with some of the heavy implements. The Birdsalls tend to several fields which are farmed on a rotational basis. 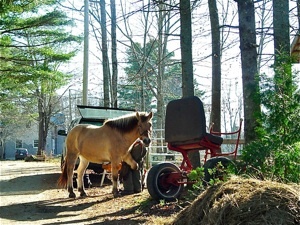 Unique Maine Farms commends the Birdsall family for all that they have contributed to organic farming and their successful utilization of horses on a working farm in Maine. It is Paul Birdsall’s work with land conservation; however, that seems worthy of the most significant attention. 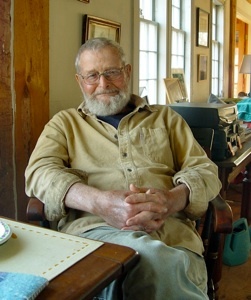 It was gratifying to see that he received recognition for his conservation efforts by being awarded the 2012 Espy Land Heritage Award by the Maine Coast Heritage Trust in May 2012. Paul had the foresight to realize the importance of preserving farmland way back in the 1970’s. 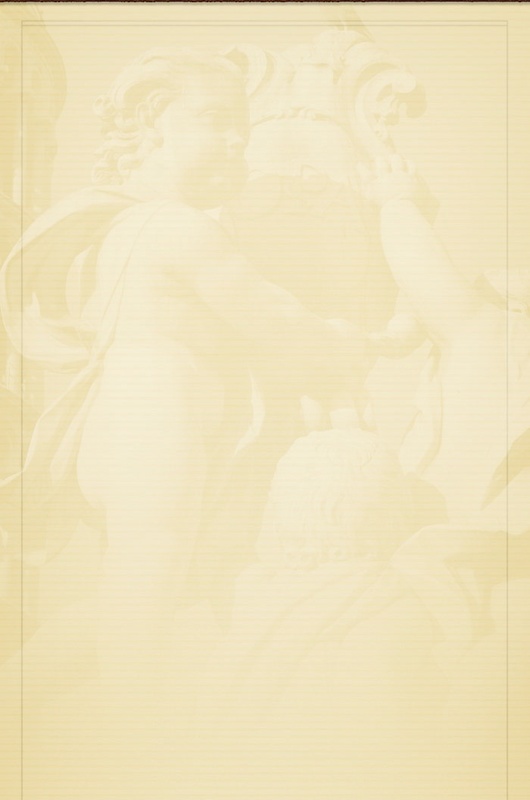 He believed that the quality of the soil in the Blue Hill area is exceptionally good. The fine sandy loam on his farm maintains soil moisture and drains well. The thought of watching the area farmland becoming developed was simply not acceptable to Paul. Birdsall was one of the founding members of the Blue Hill Heritage Trust, which was established in 1985, to “conserve land and water of special ecological, natural, agricultural, scenic, cultural and recreational significance” in the Blue Hill area. 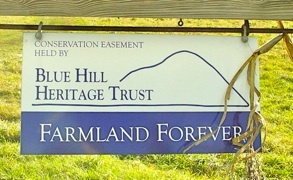 Paul started the “Farmland Forever” program at the Blue Hill Heritage Trust. Through this effort, he was responsible for saving over 2000 acres of farmland from being developed. Paul arranged for a conservation easement to be placed on his 383-acre farm. Because of this easement, only farming will be allowed to take place on the land. He also bought two other farms in the area and assured that they too would remain as farms by placing conservation easements on them and linking the two farms so that they could be purchased by two young farming families. Thanks to the support of Paul and other volunteer members of the area, the Blue Hill Heritage Trust has worked to save over 6,200 acres at this point in time. 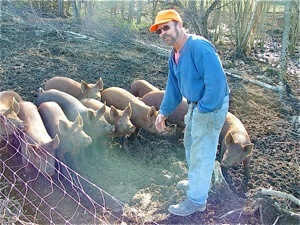 Paul has also been committed to the work of Maine Farmland Trust. He is a founding member of the statewide group and still serves on their Board of Directors. 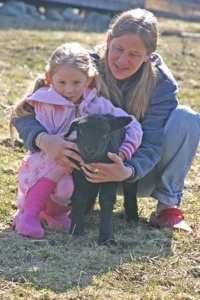 He was responsible for starting the Forever Farms program at Maine Farmland Trust. 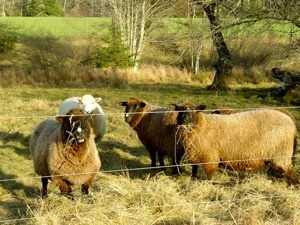 Through the “Buy, Protect, Sell” program which was created from the example of Paul’s innovative conservation work, the Maine Farmland Trust has conserved 7,700 acres of farmland in Maine and enabled thirty-four farmers to be given the opportunity to have access to land that they can farm. and keen intelligence is immediately apparent. Paul graduated with a degree in American history. Reading is a favorite pastime and when Unique Maine Farms visited, he was enjoying a history book about New England farming’s potential by Professor John Carroll of the University of New Hampshire. He also is an admirer of Wendell Berry, who is a Kentucky farmer, activist, and author of many stories, poems, and essays. always “have a place” in the hearts of many Maine farmers. 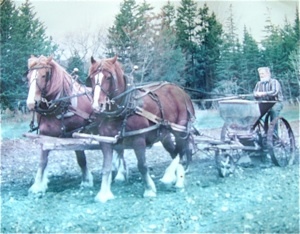 A copy of a photo of Paul working a team of horses. 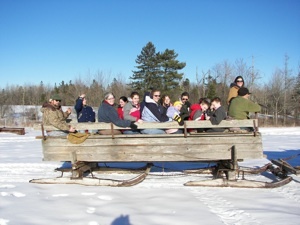 A special thank you is extended to Donna Birdsall for sharing so many photos such as the sleigh ride pictures, images of the logging operation and the horses working around the farm, several crop pictures, and some family snapshots.